GUMRI — Armenians in Gumri celebrated the 22nd anniversary of independence appropriately with music. 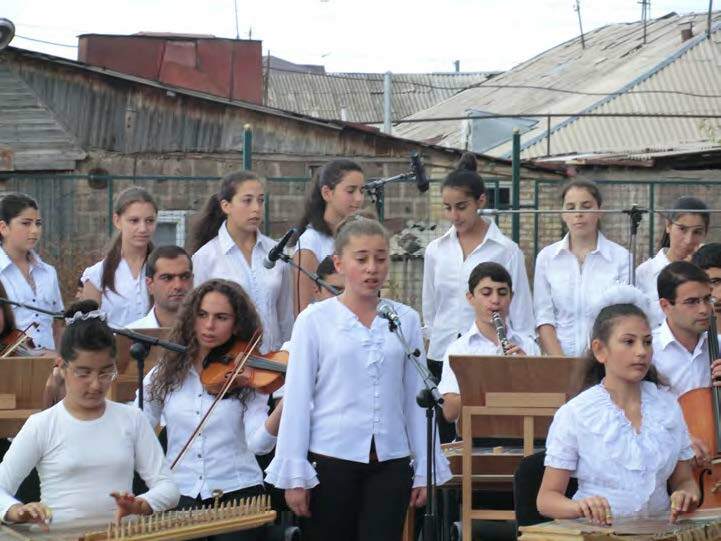 On September 20, a day before the official festivities took place in Yerevan and other cities, leading national figures joined by international guests officiated over the opening of the brand new Octet music school, which had been destroyed in the 1988 earthquake. All those who participated in the years-long effort to establish a new school were on hand: the musicians from England and Australia, Ian Gillan and John Dee of Deep Purple, who had originally launched the idea after having visited the devastated area and, through benefit concerts and commemorative CD’s, raised the initial funds for the project; Edward and Janet Mardigian, whose Mardigian Foundation tripled the amount raised by the Rock Aid Armenia campaign; Armenian President Serge Sargisian, whose government donated further funds for construction; the Governor of Shirak region Felix Tsolakyan and Gumri Mayor Samvel Balasanyan; officials of the Fund for Armenian Relief (FAR), both from the leadership in New York and the Yerevan office; church leaders, including Archbishop Khajag Barsamian from New York; last but not least, Haik Hovivyan, president of the Kanaka construction company which built the school in record time, and Harutyun Asatryan, director of the school, his teaching staff and — most importantly — his students. As soon as the president had arrived and local and international guests gathered in front of the beautiful stone edifice, festively decorated with red and white balloons, the Gumri local brass band launched a musical salute. 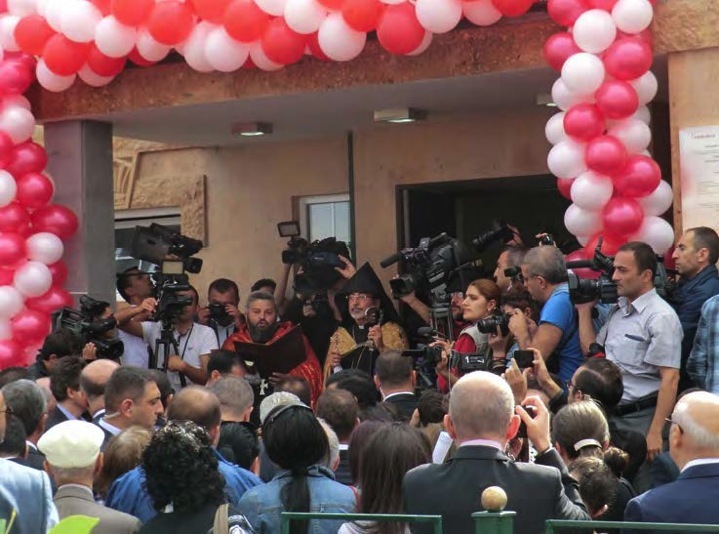 Under the shrouds of dozens of cameras, manned by journalists from local, national and international networks and newspapers, Archbishop Khajag Barsamian, Primate, Diocese of the Armenian Church of America (Eastern), offered blessings in a short religious service, after which Ian Gillan ceremoniously cut the red ribbon. After strolling through the classrooms, offices and recital hall, the entourage gathered in the new amphitheater built to host open-air concerts. The representatives who spoke said everything one would expect on such an occasion: some recalled the tragedy that hit Gumri and Spitak, others chronicled the process leading to the reconstruction effort, and all expressed their heartfelt thanks to those many who had made it happen. But there was nothing perfunctory or formal in their remarks. The ceremony was deeply moving. Gillan, who recounted his experience in Spitak in 1990, cited one image, a human image, of the suffering: it was an old woman he encountered, who had a photograph of her extended family, her siblings, her children and her grandchildren, along with cousins and nephews and nieces. There were 28 people in all — all of them, he reported, had perished in the quake. In 2009, as Barsamian summarized in his remarks, the project took on concrete form. Together with FAR and the Mardigians, they raised more funds and mapped out plans for construction. The government joined the effort with financing and political support. A large donation of new musical instruments had arrived from Canada, from Tim Irving of the Who Cares group, also associated with Gillan et al. Archbishop Barsamian saw “God’s presence” in the effort, which “inspires human compassion, creativity and the love of beauty.” It was these musicians, “angels of mercy” who, moved by the music of the school, which for years had been the training ground for children of special talent, came to its rescue. Most appropriately, what followed the speeches was a concert, performed by the students. From ensemble music, with orchestra and traditional Armenian instruments (duduks, kanouns and drums), to soloists, both instrumental and vocal, the students gave the guests a sample of their achievements they played and sang with precision, passion and joy. Local and national media covered the event in their evening news broadcasts. The local population in Gumri took special delight in the ceremony. Although, due to the presence of the president, security was extremely tight, crowds of residents from the immediate neighborhood thronged to the site, following events from the other side of the fences around the school. 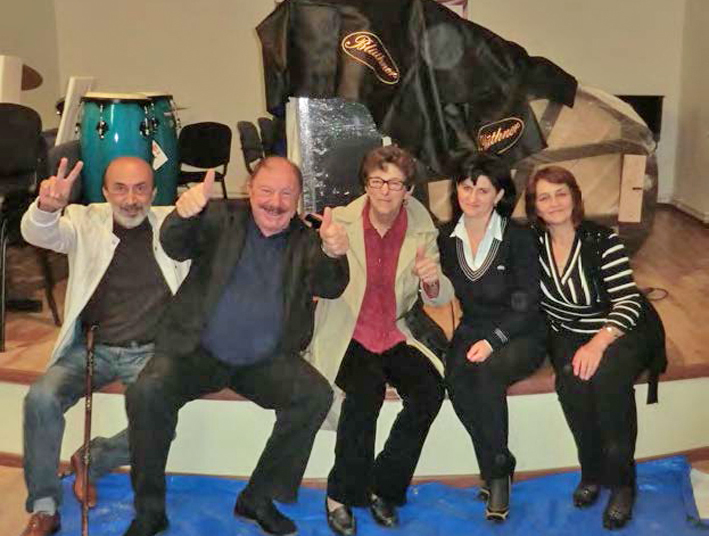 As a “coda” to the official opening, on September 23 the Blüthner grand piano donated by the Mirak-Weissbach Foundation arrived in Gumri. Transported overland from Leipzig, Germany, it had made it to Yerevan on September 19, but had to go through customs procedures before being released to the final recipient. The timing turned out to be most propitious, as the public ceremony — and associated stress — had passed and the personnel at the school could arrange the rather demanding operation to transfer the instrument from its truck to the recital hall with care. It was Haik Hovivyan, the engineer who had overseen the construction, along with his crew of workers, who completed the delicate task. With the aid of a crane, a dozen workmen eased the piano out of the truck, onto the ground, and thence into its final resting place. That day, September 23, was also the first day of school for the students, and we had the opportunity to sit in on several classes and get a first-hand sense of how they learn music. In the several rooms built for individual lessons, students received personalized instruction, whether in singing or at the piano, with violin or flute or kanoun. The school offers a fiveyear program, after which many students go on to conservatory or other forms of higher education. They receive a solid foundation in solfège, and are encouraged to play by heart as soon as they have mastered a piece. There are about 42 teachers, most of them professional musicians, who train the 240 or so students who attend classes two to three times per week in the afternoons, after their regular school day. Needless to say, this year, the first day of school was a day everyone will remember. After 25 years of study in makeshift quarters, primitive metal-and-wooden shelters (“domiks”) which were supposed to be “temporary,” teachers and students can now benefit from modern, clean, roomy quarters in a beautiful building, and concentrate their efforts and excitement on great music. All expressed their gratitude for the gifts they had received from abroad — funds for a magnificent new school and lots of new instruments. They promised that on our next visit, they would treat us to a concert of classical European and Armenian music on their new instruments, including the piano from Germany. Young students in Gumri performed for the guests.